Samir Soni and Neelam Kothari pose for shutterbugs after tying the knot on Sunday, in Mumbai. The model-turned-actor was on the news recently with Bigg Boss. He and his actress-turned-jewellery designer bride had broken off briefly but got back together recently. 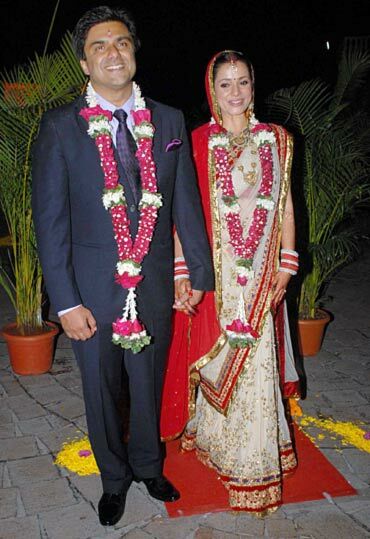 This is a second marriage for both Samir and Neelam. Neelam was earlier married to London-based industrialist Rishi Sethia while Samir was married to model Rajlaxmi Khanvilkar (who is now married to actor Rahul Roy). It was at Tusshar Kapoor's birthday party in 2009 that the two officially became a couple. His older sister Ekta Kapoor greets Samir. Besides Ekta Kapoor and father Jeetendra, there were quite a number of familiar faces at the reception. Strangely, no one from Bigg Boss was spotted, even though they had stayed with Samir for weeks. 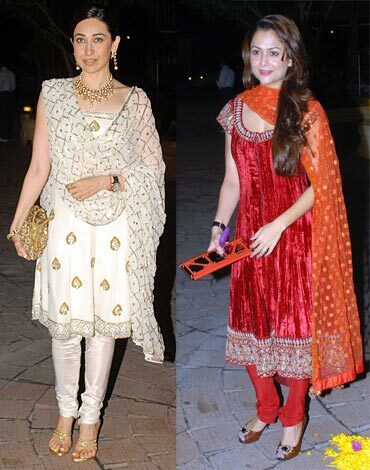 Karisma Kapoor and Amrita Arora wore their traditional best, as they arrive to congratulate the happy couple. Brothers Arbaaz and Sohail Khan arrived with their families. Sonali Bendre came in with husband Goldie Behl. 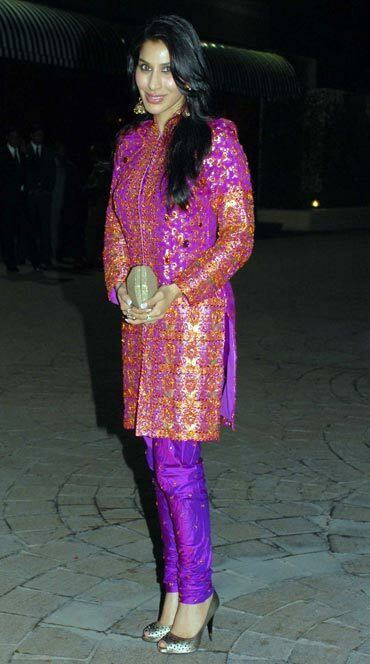 The ravishing Raveena Tandon was accompanied by film distributer husband Anil Thadani. Mandira Bedi looked pretty as she came in with her director husband Raj Kaushal. Farah Khan's brood wasn't seen around, as she posed with Arbaaz Khan. Singer/actress/veejay Sophie Choudhry made it to the nuptials as well.